Lost Dimension is coming to PS3 and PS Vita next week, on July 28 in North America. But for European area, it will lauches on August 28, one month later than North America. Lost Dimension is a new RPG from the brilliant minds of Atlus and Furyu. 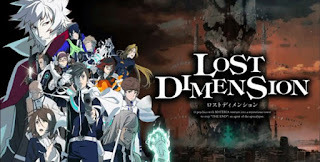 Lost Dimension is a 2014 video game developed by Lancarse for the PlayStation 3 and PlayStation Vita. The combat seems fairly common, just like any other RPG, you'll be playing turned based battles with attacks and skills. It is a tactical role-playing video game with visual novel-like elements, where the choices of the player determine the fate of the game's story, as well as its characters. But what makes this game unique is its story. You are a team comprised of 12 psychics, each having a different power, which an agency called SEALED brought together to save the world from a new threat who calls himself The End. He plans to destroy the Earth in 13 days, and it's up to you to stop him. The interesting thing about the game is how there will be traitors among you and you must figure out who's who.